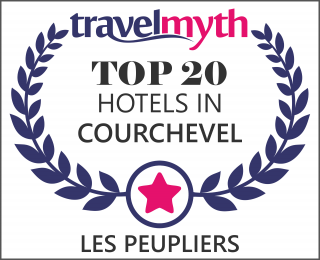 Get a feel for the atmosphere of a family-friendly hotel in Courchevel Le Praz. A quiet chalet opposite the hotel, near the lake and ski lifts. Enjoy simple and refined cuisine the whole year round. Dine on exclusive dishes in a friendly, alpine atmosphere. In the heart of the small village of Courchevel Le Praz, Les Peupliers welcomes you to enjoy the entire alpine region all year round. Perfectly located on the edge of the forest and near the Olympic ski jump facilities, the ski lifts and hiking trails, the Hotel is open 365 days a year. In winter, set off with your skis to Courchevel and the 3 Vallées, the largest skiing area in the world, directly linked to Courchevel 1850. In summer, enjoy a hike through the green mountains. The more adventurous visitors can also enjoy rafting, canyoning, via ferrata, and mountain bike riding. Activities are organised for children on and around the lake. A free shuttle service runs in winter and summer between the various altitudes in Courchevel. We spent a week at this hote and it was an AWESOME experience. The staff was great and really service oriented, the food (breakfast and dinner) was delicious, the room very comfortable, the spa clean and relaxing and location couldn't be better: few steps from a gondola and in front of a bus stop. I highly recommended this hotel and I will definitely come back if I have the chance. Need to relax and treat yourself after the day’s activities? Enjoy the tranquillity of the spa featuring a Jacuzzi, steam room, sauna, and relaxation area, as well as the bar and salon, Le Norby’s, with its warm and inviting fireplace. In summer and winter… an amazing place to visit! Courchevel is a collection of 5 villages, each with its own unique atmosphere, as well as 150 km of alpine ski slopes served by 58 ski lifts, to ensure you make the most of your day of skiing. The 3 Vallées is quite simply the largest skiing area in the world, directly linked by ski and including 8 ski resorts. It is an exceptional location, with an international reputation.